THE BODIES OF a mother and her two young children were pulled from a river in Australia today as the death toll rose from cyclone-fuelled floods that devastated parts of the country. In the most recent tragedy, the woman’s car plunged into the swollen Tweed River in northern New South Wales after veering off a muddy road on Monday. An eight-year-old girl escaped and alerted passers-by. Local media said the dead were a 43-year-old woman, her son (seven) and daughter (11), and that they were in the flood-ravaged area to help those affected. The solidarity, the cooperation, Australians pulling together, Australian Defence Forces, emergency services, police and the community and all levels of government working together to clean up, repair the damage and get back on their feet. Emergency services chiefs said the Fitzroy River in Rockhampton is set to peak on Thursday morning, with hundreds of homes at risk of flooding as locals busily filled sandbags to shore up their defences. 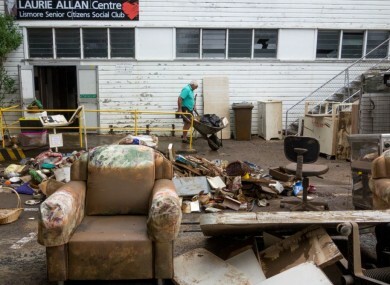 The Insurance Council of Australia has declared the Queensland and northern New South Wales regions disaster zones, estimating the damage bill will top Aus$1 billion (about €710 million). Email “Bodies of mother and young children pulled from river as Australia is devastated by floods”. Feedback on “Bodies of mother and young children pulled from river as Australia is devastated by floods”.